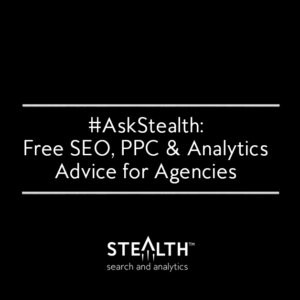 Here’s your chance to get free SEO, PPC, or analytics consulting for your agency! On Tuesday, February 6th at 1pm ET / 10am PT, Pam Aungst of Pam Ann Marketing and Stealth™ Search and Analytics will be hosting a live webinar where she will use her 13 years of experience to answer any questions your agency has about SEO, PPC, or Analytics. This is a VIP event for marketing agencies ONLY! You can also ask questions on live chat during the webinar, but submitting in advance will give you the best chance of having your question answered within the allotted time! This webinar has ended, but you can register to watch the recording below! Register to Watch the Recording!